April 28th marks the date for Halon’s 10th anniversary and I would like to share with you the story about Halon’s scripting language, HSL. In order to understand why we created our own scripting language you have to look back at what it was intended to do, and the landscape of embeddable languages in 2007. In order to facilitate this, we needed a simple scripting language. At the time, the intent was not to allow any general purpose programming features. We didn’t even want loops, in order to prevent runaway programs. If you’re not into programming languages, I should explain that creating a simple domain-specific scripting language is easy. There are tons of guides and it doesn’t take more than a few lines until you get simple arithmetic to work (5 + 6). The hardest and most important part of creating a language is the design, also called the syntax. You want to make it as easy as possible to read and write. Why not choose an established scripting language? Sieve (rfc3028), could technically have been an alternative, but in 2007 we hadn’t heard about Sieve. It crossed our paths a few years later. Speaking against it; Sieve was created by Mirapoint, an email gateway competitor at the time. Looking back, it was probably good that we didn’t end up using Sieve. Having our own language made our own platform evolve way beyond Sieve, and what you would expect of a traditional email gateway. Lua, it just didn’t happen and I suspect that if we would have considered Lua it would had been too large and unfamiliar as a language for our initial goal. 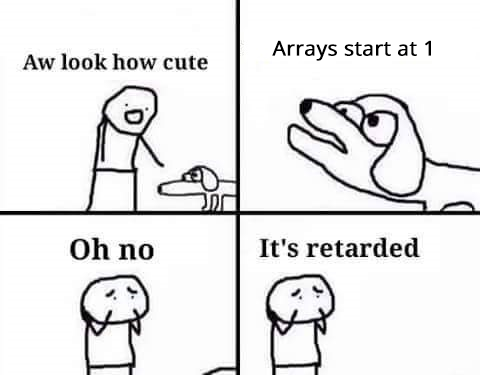 Despite the fact that arrays starts at one 😃. One of the most innovating features of HSL is the cache statement as it allows you to cache the result of any function call based on the input arguments. Sure, the same functionality can be built in other ways, but having such a powerful tool so easy at hand in HSL makes it stand out. It gets really neat when you do network lookup queries, such as API lookups using http() or ldap_search(). I personally really like the concept of custom languages, I think it’s important to try to evolve and challenge the concept of established languages, and by doing so we progress and learn from each other. I think every new language brings something new to the table; it can be a specific feature or the entire concept of why it was created in the first place. The main focus in Halon 4.5 release is TLS, hence the name “certy”. Check out the the new features and functions and try them out. Also, the knowledge base is growing with a lot of good how-to’s to help you around. TLS information has been made accessible in the Halon Platform scripting language, both on the receiving and sending side. Support for X.509 client certificates has been added, allowing you to both verify the sender identity in the SMTP server, as well as identify yourself when sending email through an SMTP client. Experiment: we configured a busy email system to ask for a client certificate for all inbound connections, and found that approximate 5% of all traffic provides a client identity. Most of the traffic is from Gmail and Office356. We did not collect the percentage of domains, which we leave as an exercise for you. How to enable this feature and start authenticating clients was documented as KB article. Implementation and facilitation of TLS reporting (tlsrpt) has begun. It is a new standard for reporting TLS failures, mainly focused on MTA-STS and DANE. The TLSSocket() class now have a getpeercert() function and the ability to specify a client certificate. Now you see why we called it” certy”? Support for custom SASL authentication mechanism has been added. This allows you to build authentication schemes such as OTP, OAUTHBEARER or CRAM-MD5, but also EXTERNAL to facilitate the client certificate features. The procedure is documented in our knowledge base along with two sample implementations. If you haven’t found our knowledge base before, the KB is a place to find how-to’s. The dev team is expanding it as fast as we can, adding topics that customers have asked about. Finally, I want to highlight the big effort we’ve done to simplify, modernize and overall improve the web administration. This is an ongoing project, and something that we’re paying a lot of attention to. We want to thank, and congratulate, the Bootstrap team for providing such a awesome framework. We managed to get the Bootstrap 4.0 release in, with just a few days of work. You can read the full changelog on our GitHub of all the other features big and small. The 4.4 release “lofty” is all about fixing bugs, boost existing features, and improve performance and memory management in the Halon script engine. And like macOS “High Sierra”, it’s fully baked. The unusually long changelog contains many small improvements. We’ve given the pre/post-delivery script a slight overhaul. It’s now possible to tailor the bounce behaviour via the the SetDNS() function. Additionally, we’ve added $action and $context, as well as functions to set MAIL/RCPT parameters. Finally, the SetSouceIP() enables you to choose an IPv4 and IPv6 address pair, which is a great when you want to provide customers with a private IPv4 and IPv6 or if you want to use diverse address pools. The improved “Listen on” directive on the Server > SMTP listener page enables more fine-grained control over listen ports and IPs; such as listening on different ports for different IPs. We recently revised our LDAP implementation, and realised that our own syntax and mechanism for failover between hosts is rather superfluous, since OpenLDAP supports that natively. Consequently, we adopted the standard LDAP URI’s in our configuration, and existing configurations will be automatically migrated. While we support the PROXY protocol (v1) that passes client source IP information from load balancers, we thought it was mostly as HAProxy thing. Apparently, it’s used by many other load balancers such as Amazon ELB, Citrix Netscaler, and F5 BIG-IP. Most of them implements the version 1 (which is human readable), but there is a second version of the protocol that’s binary-packed, and have a quite smart feature: its magic string (protocol identification) is \x0D\x0A\x0D\x0A\x00\x0D\x0A\x51\x55\x49\x54\x0A which translates into literal "\r\n\r\nQUIT\r\n", a string chosen specifically to case an error and disconnect against servers not supporting this protocol. Clever! If you have a IPv6 only datacenter, but still want to process IPv4 clients, you can do so with a SIIT-DC gateway which uses IPv4-mapped-IPv6 addresses. In Halon, you can use SIIT-DC while still performing IPv4 reputation (such as DNSBL), by extracting and setting the IPv4 address in the CONNECT script. If that doesn’t make the point that we’re very scriptable, then what does? If you ever had problems signing in to a Halon using Firefox, it can be because a recent change in how “secure cookies” are handled. When signing in over HTTPS, we set the secure cookie flag, which forbids the cookie to be send over a unencrypted HTTP connection to the same host. That is all great, but if you then try to sign in over HTTP (for whatever reason) Firefox will not be able to login because there is already a cookie for that domain with the secure flag and it cannot be replaced, nor accessed. We addressed this by using different cookie names for HTTP and HTTPS. Regardless of this fix, you should not use HTTP when administering your Halon hosts. We have done two new releases of Halon since last time we updated the blog with release matters. In Halon 4.1 “teamy”, released just before this summer, we introduced modules. A month later we followed up with 4.2 “classy” that added proper object orientation to the language (which works great in combination with modules). It spawned a few rewrites of our script examples (modules) to reflect this awesomeness. We initially added instance and class methods and variables (static), and in 4.3 “cody” we added the private keyword to functions and variables as well. We’ve created a lot of modules and script examples. Some of those, such as the PostgreSQL and MongoDB modules, rely heavily on byte packed data structures. In order to better support those, we’ve added built-in functions such as pack() and unpack(). Upcoming modules and rewrites will also benefit from the new TLSSocket() class. One major change that only we can see and fully appreciate is the (both automated and manual) code migration to C++11 (and forward), using the truly awesome clang-tidy tool. On another note; while we researched pack and unpack implementations by looking at other languages’ documentation (such as PHP, Perl and Python), we found a bug in PHP, which was fixed in 7.2, and backported to 7.1.9. The overall consensus of syntax and conventions amongst languages regarding how pack and unpack should work seems to reflect and mimic Perl. MongoDB does unlike many other databases use little endian and not big endian (network byte order) in its wire protocol. This will let you send and receive data structures in native machine endian (for most people) since both x86 and amd64 use this convention. I highly recommend reading up on the fun historic trivia about endianness. Want more in-depth info on the new releases? Get in touch with the support team. The Safe Link technology was recently launched by Microsoft through Office 365. The goal of this technology is to rewrite all URL’s in email to a URL classification service, so at the time of user-clicks it’s possible to reclassify a URL. This method is preferred as spammers more often replace the phishing URL’s site content after a message is being scanned, hence there is a need of reclassification later. Safe link is Microsoft’s “best-effort” to do so. ^--- the regex? engine stops to detect the <a> tag here, and leaves the href unchanged. Another obvious way to fool the Safe Link re-writer is to use a <form>-tag (it may not work in all email clients). You may be safe until spammers figure this out. If it’s this easy to fool, should it be done in another way or perhaps complemented with additional safeguards, preferably in the MUA (web mail, Outlook.app, etc)? I think so, and would have expected that Microsoft tried harder. Second suggestion; Microsoft could surely use one of there own HTML parsers (like the one in the Edge engine) to detect where URL’s are located in the message in order to properly replace them, it’s probably better than a regex. If customers are activating and paying for Safe Link they should be able to expect more value for their money and some more security. In Halon you can do the same simple URL rewriting using this HSL code. It’s time for yet another deep dive into our platform. This time we’re going to tell you about when and why HSL got classes with closures. It started when we revisited our MIME implementation. The MIME implementation was kind of basic, but served most people well. However, it could at the time only work on the top level MIME objects header and all MIME parts were simply addresses by IDs. Although the structure of MIME is highly nested with children and siblings and all MIME parts share the same features, there is a header and a body-part (which could be even more MIME parts). This data structure is ideal to be represented as objects in a tree structure; which got us started to sketch how we really wanted you to work with MIME objects.